On Saturday 29th April 1815, Governor Macquarie with his wife Elizabeth and a party of some fifty gentlemen, servants and soldiers descended Mt York and travelled across the Hartley Valley to what is today Glenroy, on the Jenolan Caves Road. They camped on the delightful river flat at the junction of the Cox’s River and the River Lett and had a day at leisure on the Sunday. Prior to exploring the country around their campsite, on the Sunday morning Macquarie recorded ‘After breakfast I had Divine Service performed’. 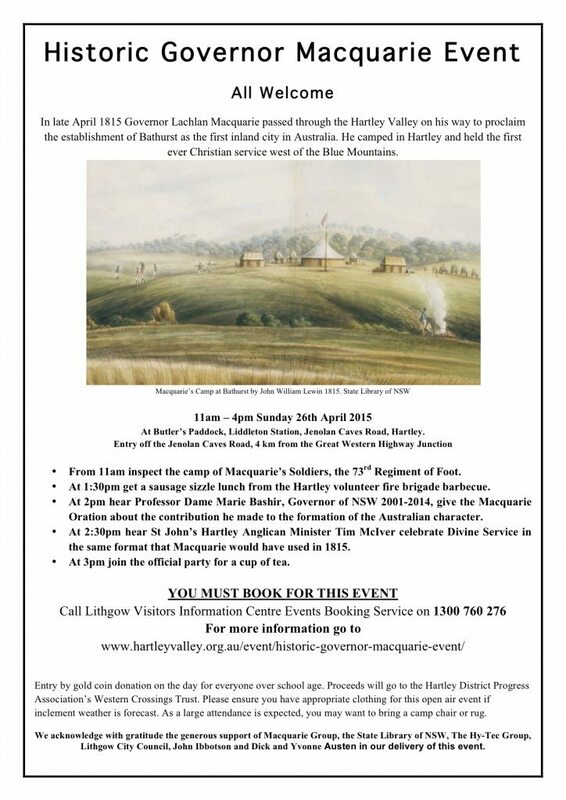 On 26th April 2015, the Hartley District Progress Association, in conjunction with the Macquarie Society, commemorated Governor Macquarie’s visit and his holding of the first Christian service performed west of the Blue Mountains. The event was held in Butler’s paddock, overlooking Cox’s Road on which the Macquaries’ made their way to Bathurst, the valley campsite where this first service was held and Mt Blaxland, the end point of Blaxland, Lawson and Wentworth’s 1813 crossing. The 73rd Regiment of Foot Re-enactment Group; a group reliving the times of Macquarie’s 73rd Foot Regiment, brought to Australia to replace the discredited New South Wales Corps (the so called Rum Corps), joined us on the day. This was the group’s last official event before proceeding overseas to participate in the bicentenary re-enactment of the Battle of Waterloo in June 2013.